MAX WILL BE PLAYING WITH HELENE GREENWOOD AT 229 VENUE, LONDON ON 27TH NOVEMBER 2015. MAX HAS JUST SIGNED SEVENTEEN TRACKS OVER TO SPEAR MUSIC, A NEW PLAYER IN THE PRODUCTION MUSIC INDUSTRY . THEY HAVE DEVELOPED A FLASHY WEBSITE WHICH USES A UNIQUE ALGORITHM ALLOWING MUSIC SEARCHERS TO FIND WHAT THEY ARE LOOKING FOR FASTER. CHECK IT OUT HERE. MAX HAS BEEN INVITED TO PLAY ONCE AGAIN WITH CATHAL SMYTH (AKA CHAS SMASH FROM MADNESS) AND THE JOE DUDD﻿ELL ENSE﻿MBLE AT THE WALKIE TALKIE BUILDING IN LONDON ON THE 9TH MARCH. MAX HAS COMPOSED A TRACK FOR BIG SCREEN MUSIC'S NEW RELEASE A JAZZ ROMANC.. THE TRACK IS CALLED ONLY YOU AND YOU CAN HEAR IT HERE. 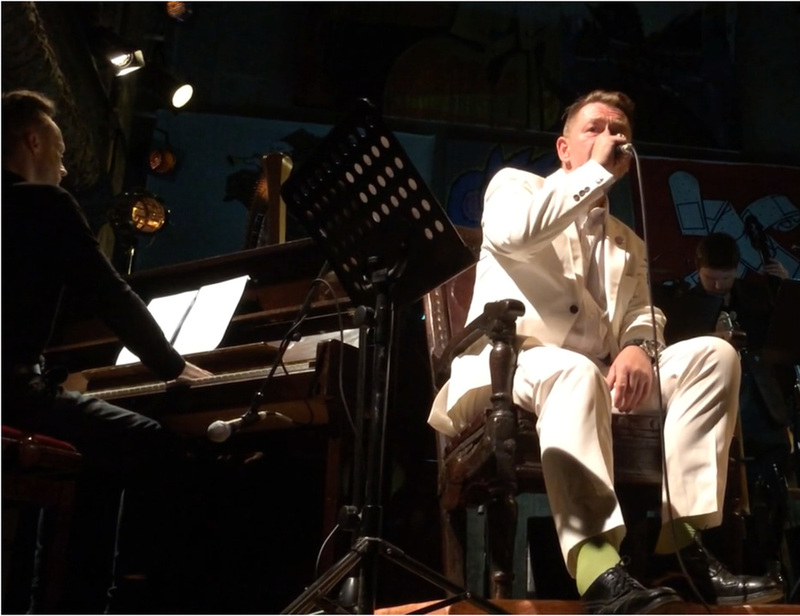 MAX WILL BE PLAYING PIANO WITH THE JOE DUDDELL ENSEMBLE FOR CATHAL SMYTH (AKA CHAS SMASH FROM MADNESS) AT WILTON'S MUSIC HALL, LONDON, ON THE 7TH, 8TH & 9TH OCTOBER. THE LONDON COLLEGE OF MUSIC CHAMBER CHOIR WILL BE PERFORMING MAX'S WORK SANCTUS AT THEIR CONCERT IN CELEBRATION OF THE CENTENARY OF WILLIAM LLOYD WEBBER. THE CONCERT IS AT ST. MARY'S CHURCH, EALING ON 13TH MARCH 2014 AT 7PM. MORE DETAILS HERE. MAX WILL BE ACCOMPANYING SINGER HELENE GREENWOOD AT THE TRUBADORE ON THE 6TH MARCH 2014, AND AT PAPER DRESS ON 20TH MARCH. MAX HAS COMPOSED THE MUSIC FOR UK COFFEE WEEK'S PROMOTIONAL ANIMATION BY ALEX RODEN. YOU CAN VIEW THE VIDEO HERE. EMPATHEYES THEATRE'S PRODUCTION OF 1984 (WITH ORIGINAL MUSIC BY MAX WILSON) HAS BEEN LONG LISTED FOR THE AMNESTY INTERNATIONAL AWARD. MAX WILSON'S BAND WAVERLEY KEYS WILL BE PERFORMING AT THE WILDERNESS FESTIVAL ON THE 10TH, 11TH & 12TH AUGUST 2012. A NEW ADAPTATION OF 1984 BY MATTHEW DUNSTER OPENS AT THE EDINBURGH FRINGE THIS SUMMER AND EMPATHEYES THEATRE HAVE ONCE AGAIN CREATED AN EXCITING PRODUCTION WITH LIVE MUSIC, PROJECTED FILM AND PHYSICAL THEATRE. MAX WILSON HAS ADAPTED AND EXPANDED HIS ORIGINAL SCORE FROM THE PRODUCTION AT THE BLOOMSBURY EARLIER THIS YEAR. THE PLAY RUNS AT THE ZOO FROM 4TH-27TH AUGUST 2012. MAX WILSON HAS COMPOSED ORIGINAL MUSIC FOR EMPATHEYES THEATRE'S PRODUCTION OF 1984 BY GEORGE ORWELL. MAX WILL CONDUCT AN EIGHT-PIECE ENSEMBLE OF MUSICIANS DURING EACH PERFORMANCE AT THE BLOOMSBURY THEATRE, LONDON ON 23RD, 24TH & 25TH FEBRUARY 2012. MAX WILSON'S NEW WORK CRYSTALLINE FOR HARP AND VIBRAPHONE WILL BE PREMIERED BY EDDY HACKETT AND STEPHI BECK AT THE MUSEUM OF MODERN ART IN LIECHTENSTEIN ON 22ND JANUARY 2012 WITH SUBSEQUENT PERFORMANCES IN GLASGOW, AYR, LONDON AND TISBURY. MAX WILSON HAS COMPOSED TWO TRACKS FOR BIG SCREEN MUSIC'S NEW ALBUM RIVIERA JAZZ; ONE OF THE TRACKS, PRES DE TOI, IS A COLLABORATION WITH THE UP AND COMING SINGER-SONGWRITER OLIVIA FLENLEY. YOU CAN HEAR THE TRACKS HERE. MAX WILSON HAS COMPOSED AN ORIGINAL SCORE FOR BLACKOUT BY DAVEY ANDERSON. THE PLAY IS DIRECTED BY EMMA BIRD AND SHOWS AT THE THREE AND TEN THEATRE, BRIGHTON ON 13/14TH SEPTEMBER 2011 AND THE ETCETERA THEATRE, LONDON ON 19TH OCTOBER 2011. ONE FLEW OVER THE CUCKOO'S NEST (WITH AN ORIGINAL SCORE BY MAX WILSON) HAS MADE THE FINAL OF THE LONDON BEST PLAY AWARD 2011. THE PRESENTATION CEREMONY WILL TAKE PLACE AT THE WALDORF HILTON HOTEL ON 28TH JULY 2011. EMPATHEYES THEATRE HAVE SECURED FUNDING TO PRESENT ONE FLEW OVER THE CUCKOO'S NEST AT THEATRE TECHNIS IN LONDON FROM 1ST-12TH MARCH 2011. MAX WILSON HAS ADAPTED AND EXPANDED HIS ORIGINAL SCORE FROM THE PRODUCTION AT THE ARCOLA THEATRE IN 2009. HE WILL BE DIRECTING (FROM THE PIANO) AN ON-STAGE ENSEMBLE OF MUSICIANS, WHO WILL ALSO PLAY THE ROLE OF PATIENTS. MAX WILSON HAS COLLABORATED WITH STEPH PATTEN ON THE SCORE FOR HEAT AND LIGHT'S PRODUCTION OF US LIKE GODS. THE PLAY WILL SHOW FROM 3RD-5TH DECEMBER 2009 AT HAMPSTEAD THEATRE IN LONDON. ZAZU'S THEATRE COMPANY IN ASSOCIATION WITH HACKNEY MIND IS PRESENTING TWO TRIAL PERFORMANCES OF KEN KESEY'S ONE FLEW OVER THE CUCKOO'S NEST. MAX WILSON HAS COMPOSED THE MUSIC AND WILL DIRECT A QUARTET OF MUSICIANS FROM THE PIANO DURING THE TWO PERFORMANCES AT THE ARCOLA THEATRE ON 26TH JULY 2009. MAX WILSON'S NEW WORK PLANE SHIFTING FOR TUNED PERCUSSION AND PIANO WILL BE PREMIERED BY EDDY HACKETT AND KEITH FORD AT THE UNIVERSITY OF GLASGOW CONCERT HALL ON 20TH NOVEMBER 2008. MAX WILSON HAS COMPOSED ORIGINAL MUSIC FOR THE NATIONAL YOUTH THEATRE'S PRODUCTION OF TORY BOYZ BY JAMES GRAHAM, WHICH RUNS FROM 15TH AUGUST - 13TH SEPTEMBER 2008 AT THE SOHO THEATRE, LONDON.